Zdravime priatelov a fanusikov dobrej hudby!!!! Rok ubehol ako voda my tu mame zasa raz cas predvianocny, ktory uz klasicky patri nakupom darcekov a kvalitnym koncertom. 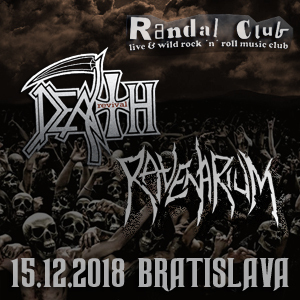 Death revival samozrejme pokracuje v dobre znamom scenari, kedy si koncertom ucti pamiatku zosnuleho Chucka Schuldinera, ktory nas necakane opustil pred 17timi rokmi (13.12.2001). Svojim vystupenim vam pripravime show, ktora bude odzrkadlovat cely prierez tvorby kapely Death. Na vypomoc nam pridu zahrat nasi "bratia" z Ravenarium!!!! Vdaka ankete sme zistili, ze si najviac prajete ako predkapelu chalanov z Immersion, tak sme vam vyhoveli samozrejme. Na druhu stranu dame ale aj sancu druhemu miestu, takze sa mozete tesit aj na Dysanchely!!!!! Lupene si mozete zakupit dopredu a to konkretne cez predpredaj.sk (link tu najdete), hodnota listka v predpredaji je 6 Eur. Na mieste bude vlezne 8 Eur!!!!! Greetings to the friends and fans of exceptional music! Christmas comes but once a year, and it’s high time for presents shopping and quality gigs. Death Revival is continuing the tradition of honoring the memory of late Chuck Schuldiner, who unexpectedly left us 17 years ago (13/12/2001). Our show will take you through a performance reflecting the complete works of Death. Our “brothers” from Ravenarium will be supporting us too! This death/black/fusion metal band will play both older and newer songs, and there will be a guest joining the band on stage. As for the third band, we want YOU to help and decide! The interested bands should contact us by messaging us on our FB profile. Then we’ll make a poll and you’ll choose the last band to complete this epic night. The same approach has yielded phenomenal success last year, when you have chosen not one, but two bands and the result had been flawless! Don’t miss your chance to contact us, preferably listing the requirements of your band, if any. Bands, whose requirements we can not fulfil, for financial reasons for example, will be unfortunately excluded from the poll.